The poem above, used by Catalan composer and guitarist Fernando Sor in one of his Seguidillas Boleras, was well known in Spain during the 1800’s. It represents an account of the presence and popularity of the guitar in Spain during that time. Although the status of the instrument differed in other countries and periods, people from the most diverse social layers have rendered themselves to the deepness and beauty of its sound in a variety of genres and styles, disseminated in a vast literature throughout history. The sound of stretched strings over some type of resonance box seems to have been part of social aggregations from their beginnings. It was strong enough to be influential even in the realm of mythology. A legend from the fourth Homeric hymn describes the invention of the first plucked-string instrument and associates it with a magical power, capable to captivate even a god. The instrument is portrayed as a central element in the resolution of a conflict between the brothers Hermes and Apollo, two of the sons of Zeus. According to the story, the first had invented the first plucked-string instrument by stretching strings made from cow gut into the carapace of a dead turtle. Homer also tells us that as an infant, Hermes had stolen Apollo’s cattle. At some point, Hermes was compelled by Zeus to reveal the theft to his brother, who then demanded his cattle to be returned. When Hermes was on the way to do so, he played his invention. Incapable to resist the beautiful and mysterious sonority of Hermes’s instrument, Apollo agreed not to kill his brother and even allowed him to keep the stolen cattle in exchange for the instrument. The notion many times attributed to the guitar of having an inexplicable sound, capable of penetrating and reaching even unknown dimensions of one’s self, seems to fit adequately to the puzzling reality of the origins of its historical process. Although scholars have presented ideas regarding the origin of the guitar and its inclusion in the European society, most of what has gotten to us about this matter can only be guessed. On the other hand, there are several sources that make possible the understanding of the history and the literature of the instrument since the fourteenth century. There is no documentation that allows one to define the facts concerning the genesis of the guitar with absolute certainty. Thus, one can only speculate about subjects such as the place of origin or the specific dates in which the first guitars (or instruments resembling a guitar) were made. Connections of this sort can be perhaps supported by iconographic examples that reveal instruments portraying a guitar-like shape. Nonetheless, evidence is scarce and attempts to prove the existence of the guitar as a distinct instrument prior to the fifteenth century are only conjectures. 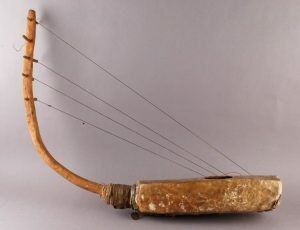 The oldest example of a chordophone is believed to be the musical bow, which would have been developed from the hunting bow. In its simplest form, it had one single string fastened to the ends of a flexible stick. 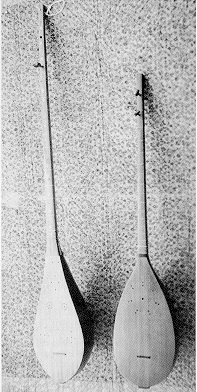 As it developed, extra strings with other lengths allowing for new pitches, and resonators made from a gourd, or wood, or some other material, were added. The result is an instrument called the bow harp. 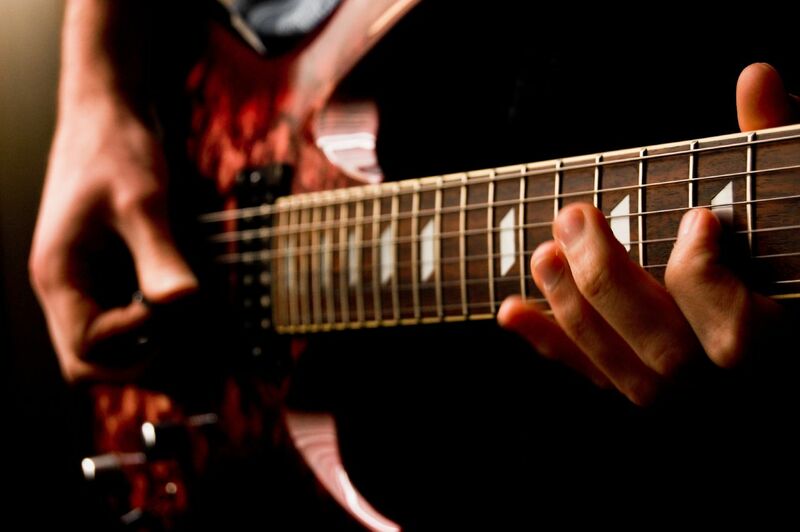 The linguistic origin of the guitar can be traced back to Sanskrit derived languages such as Bengali, Hindi, and Urdu, from the northern India, and to those of central Asia, most specifically modern Persian. An analysis of the cardinal numbers involving Sanskrit and Persian (Old and Modern) reveals several types of instruments connected with the word târ, meaning string. The instruments were named by adding a prefix that indicated the number of strings it had. Thus, the Sanskrit words dvi, tri, chatur, and pancha, associated to the numbers two, three, four, and five, became the words do, se, char, and panj in modern Persian. 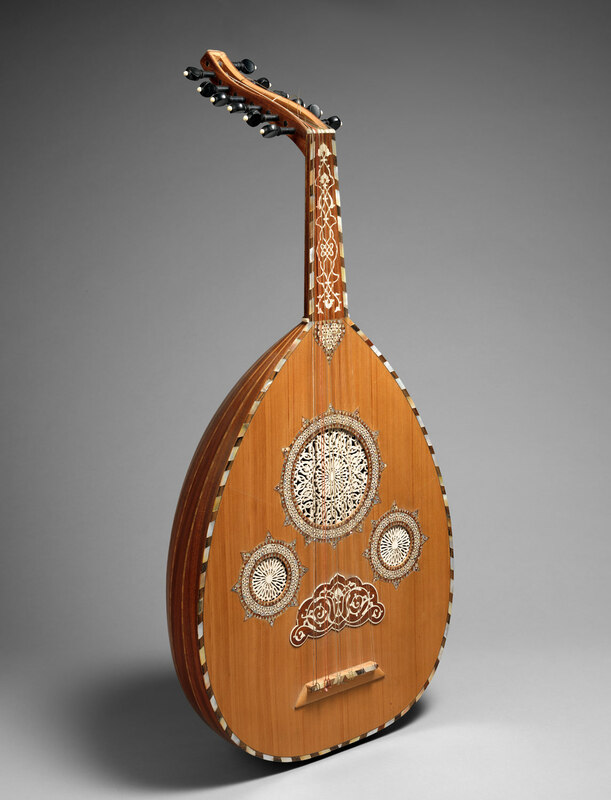 Some of these instruments such as the dotâr in Turkistan, and the setâr in modern Iran are still in existence today. Following this line of reasoning, the chartâr, a fourstring version of the târ, would eventually have reached Spain in the beginnings of the A.D. era. The name chartâr would have become the Spanish word quitarra. The similarity between this word and the Greek kithara is quite obvious, and according to Michael Kasha, the fact that both the earliest Greek kitharas and lyres had four strings could explain the connection between the words. In spite of the etymological relationship between the terms kithara and guitar, the widely spread notion that the guitar evolved from the kithara has been long ago proved to be mistaken. Nonetheless, several books in which the origin of the guitar is mentioned to some extent still associate it with this Greco-Assyrian instrument. Kasha’s article, dated from August 1968 published in the Guitar Review, indicates four postulates which were formulated and confronted against the archeological and written evidence: the accordatura, the morphology, the complexity, and the geographical continuity postulates. 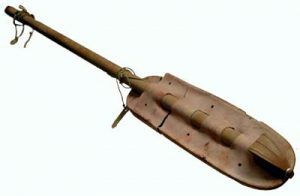 Two of the postulates described by Kasha are used in the article to refute the notion that the guitar had its roots in the kithara. The complexity postulate infers that the number of strings tend to increase progressively over the centuries. If true, it would be very unlikely that the kithara, possessing seven to eleven strings would have evolved into a four-course instrument during the middle ages. The validity of this postulate is strengthened by the fact that the kithara is known to have reached as many as twenty strings before it became obsolete. Perhaps stronger is the morphology postulate, by which the process of evolution of an instrument can be traced back to its origins via observation of very slow changes over broad periods of time such as centuries and millennia. 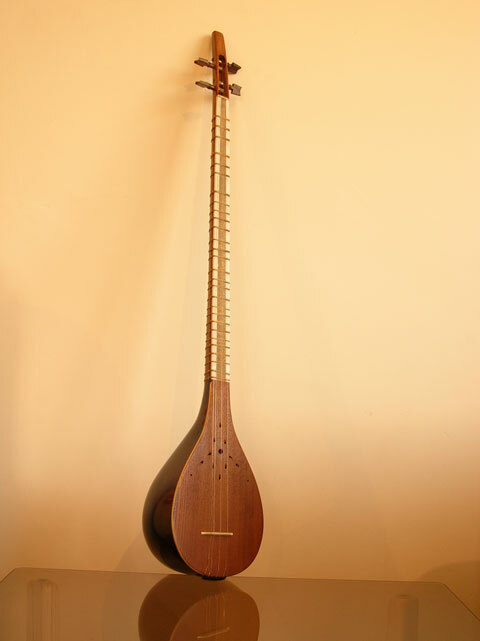 According to it, the kithara would not be associated with the guitar because it was a harp-like instrument without neck and did not bear any resemblance with the latter. Even before Kasha presented these postulates, other researchers had to look for different alternatives to the question regarding the ancestors of the guitar because the absence of a neck in the kithara was a definite reason for its non-acceptance as the precursor of the guitar. Among the quoted plausible ancestors are the long-necked lutes found in the region between the Euphrates and Tigris rivers (the early Mesopotamia and Anatolia), the lutes from Uzbekistan (dating from the first century), and the Egyptian bas reliefs of the Eleventh and Twelfth Dynasties (3762-3703 B.C). Another account is found in the stone carvings of Hittite monuments dated 1000 B.C. encountered in Alaja Höyük in Turkey. 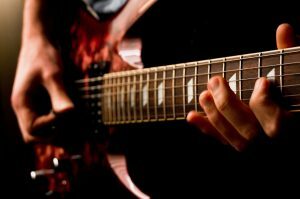 From a morphological standpoint, the guitar would have evolved from the earlier single-neck stringed instruments. In its initial stage, these instruments would have a long neck attached to some type of resonator that could be made from a variety of materials, from skulls to vegetable gourds that would be partially covered with animal skin. The Sanskrit word for gourd (tan) led to the general term tanbur. Later the gourd gave place to a solid wood box, and the animal skin was replaced by a soundboard also made from wood. Following the course of development, single-neck stringed instruments received a more refined treatment in craftsmanship: the old system of construction by which a solid block of wood would be carved until becoming a sound-box was replaced by a new one featuring the inclusion of sides or ribs as separators of the top and bottom parts. This principle directly relates to the construction of the guitar. The process of tracing the guitar back in time presents other issues that add to the already “swampy” scenario. For example, Tyler calls attention to the misinterpretation of the terms guitarra, guiterne, chitarra, and gittern by some historians who, finding them in medieval texts, wrongly assumed that they were related to the guitar. Nowadays it has been known that the terms were used to describe small high-pitched lutes and not the guitar. The most controversial aspect is perhaps whether the guitar is indigenous of the European region or was brought into the continent by the Arabs during the Middle Age. There has been a broad acceptance to the latter, by which the guitar would be related to an Arabic instrument called ūd, a short-necked, plectrum-played, and with a round back. Although this view is indeed plausible, the direct participation of the ūd in the development towards guitar like instruments is still not clear. Regarding the ūd, it was an instrument related to the tanbur, which evolution took a different direction in the Arabian countries. 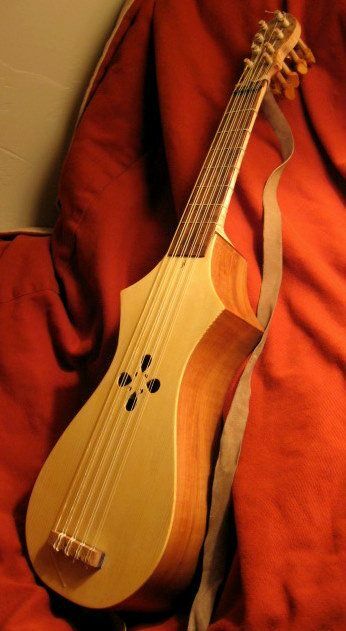 Like the tanbur, the ūd was fretless but presented different proportions from the former. 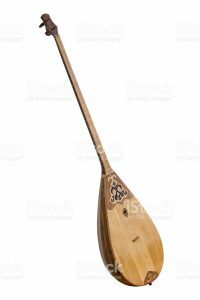 After the ūd entered Europe, it received frets by the Europeans and became the lute, derived from the Arabic term Al’ ūd, via the Spanish name laud. 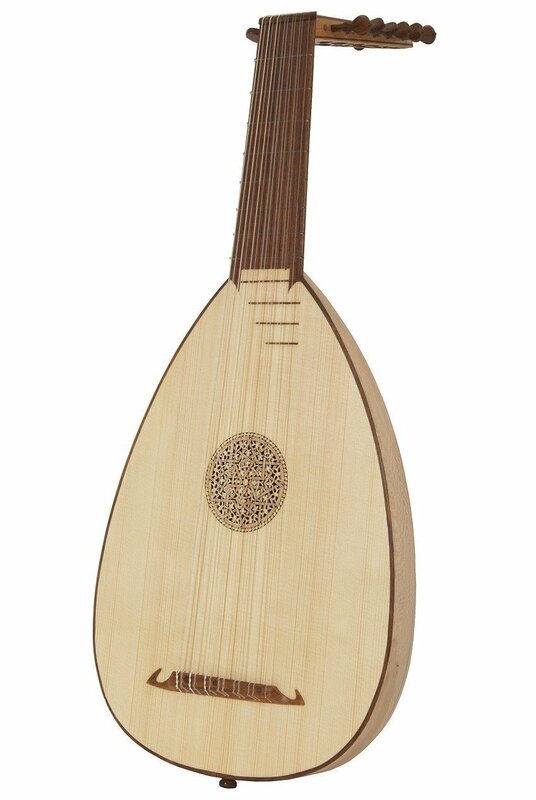 Was the lute a predecessor of the guitar? Was it indeed inserted into Spain by the Arabs or did it already exist in Europe by the period of the Muslim Conquest? What is the actual degree of participation of the lute in the evolution process of the guitar? When pondering such questions, one should consider that the Muslim courts in Eastern Mediterranean were highly developed in several areas of human society, and that it was no different with music. Since that was the case, it would be expected that such developed people would have diverse types of string instruments portraying various sizes, number of strings, and body-shapes. For the same reason, one must consider the existence of different string instruments to also be a reality during the times of the Roman hegemony. Following the presented line of thought, one may conclude that what most likely happened was a type of “amalgamation of musical styles and practices” which involved different types of string instruments, some already existent in Europe at the time of the Arabic insertion, and others brought by the Muslims as a result of the invasion. In the midst of the variety, there was one main aspect to be considered when classifying a string instrument at the time: its neck. In this sense, one would find the classification “long necked” or “short necked” lutes. The classification may seem arbitrary at first. Nonetheless, it actually relates to the function and kind of music each type of instrument would play: short “lutes” used several strings in sequence to convey melodic passages without excessive stretches to the hands, mainly employing the first few positions of the instrument, therefore eliminating the need for a long neck. On the other hand, melodies on long necked lutes would be played on only one or two strings, while the remaining would provide the accompaniment. 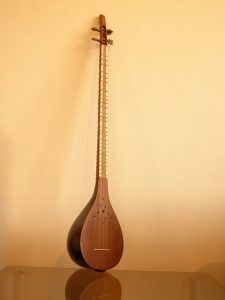 As a result long necked lutes would have few strings, usually two or three, while the short necked ones would have four or more. Iconographical evidence of the guitarra latina and the guitarra morisca is documented in the Cantigas de Santa Maria, one of the largest collections of monophonic songs from the middle ages written during the reign of Alfonso X “El Sabio” (1221-1284). His Kingdom included the regions of Castilla, Toledo, Leon, Galicia, Sevilla, Cordoba, Murcia, Jaen and the Algarbe.” The various types of latinas and moriscas seen in the collection relates to the presence of Christians, Jews, and Muslims musicians, poets, and scientists serving in his court. The majority of the pieces in the collection are Cantigas de miragres (accounts of the miracles performed by the Blessed Virgin), while every tenth is a Cantiga de loor (a hymn in her praise). 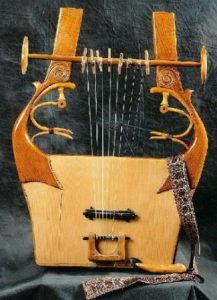 Currently, there are several web sources related to the Cantigas, and one can easily find pictures of the two distinct types of instruments. Examples of the different guitarras latinas can be found in Cantigas Nos. 10, 20, and 150, and those of the guitarras moriscas can be encountered in Cantigas Nos. 120, 130, and 140. In the search for a meaningful way to understand the ancestors of the guitar, another view would arise from a compromise between the ones already presented. 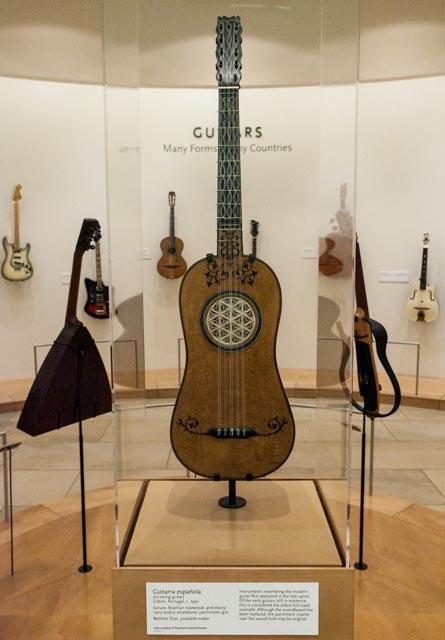 It would not be out of reason to consider that both harp-like and lute-like instruments could have simultaneously participated in the process that would ultimately lead to the appearance of guitar-like instruments. This is reasonable because the general principle of stretching strings over a resonator is common ground for both types of instruments, and several types of harp like and lute-like instruments co-existed in different regions. As the reader may have observed at this point, the broad mosaic of speculative views regarding the birth of the guitar apparently makes a precise account of the facts an almost impossible task. Although so many points remain unanswered, it is definitely known that the presence of the Arabs in Europe, most remarkably influencing the musical practices of Spain, resulted in the dissemination of several types of plucked instruments into the social life of the continent. James Tyler points that both early and modern writers about the guitar embrace the theory that the guitar had its origins connected to the Iberian Peninsula. With the insertion of the Arabs a type of “natural selection” process among the diverse plucked instruments occurred gradually, and an instrument would continue in existence until the advent of a superior version. Thus, some specimens disappeared while others were favored and continued to develop. In this context, one would not find characteristics allowing an unequivocal identification of the guitar as a distinct musical instrument until about the sixteenth century. Gen.4:20-21(Life Application Study Bible: King James Version). Ruth Midgley, ed. : Musical Instruments of the World (Holland: Paddington Press Ltd., 1976), 164. This classification would be more thorough if the term “strummed” was inserted together with “plucked.” Hornbostel and Sachs present a different classification for the instruments of the chordophone family, grouping them into two distinct categories: the simple chordophones (zither-type instruments: bar zithers, tube zithers, raft zithers, board zithers, trough zithers, and frame zithers), and the composite chordophones (lutes, harps, and harp lutes). Michael Kasha, “A New Look at the History of the Classic Guitar,” Guitar Review No.30 (August 1968):3. Nicholas Bersaraboff, Ancient European Musical Instruments; an Organological Study of the Musical Instruments in the Leslie Lindsey Mason Collection at the Museum of Fine Arts (Boston, MA: Harvard University Press, 1941), 241. Chase Gilbert, The Music of Spain (New York, NY: Dover Publications, Inc., 1959), 512. Graham Wade, A Concise History of the Classic Guitar (Pacific, MO: Mel Bay Publications, 2001), 13. 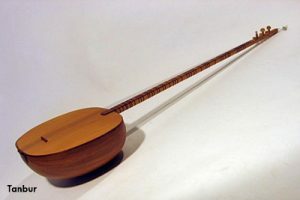 It is interesting to note that folk instruments such as the Balkan tamburitsa, the Iranian setâr, and the Turkish saz still bear a strong relationship with earlier examples of ancient tamburs encountered in archeological artifacts of early Persia and Mesopotamia. Paul Sparks, “The Guitar Before Torres,” in Tony Bacon et al., The Classical Guitar: A Complete History (San Francisco, CA: Backbeat Books, 2002), Although the source of this information is not provided in this book, I believe it was extracted from the fifteenth page of James Tyler’s The Early Guitar. The terms are equally arranged in both books, and the first one was published twenty-two years after the second. Paul Guy, “A Brief History of the Guitar,” Guitar Handbook, http://wwwguyguitars.com/eng/handbook/BriefHistory.html (accessed June 4, 2006). 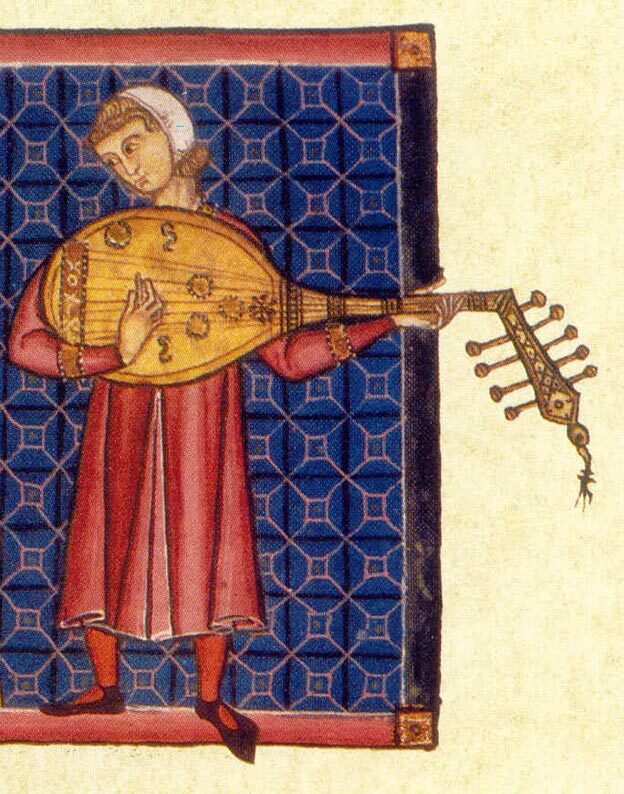 Curt Bouterse, “Medieval Instruments IIIa: Guitarras,” Alfonso X: Instruments then & Now, http://home.earthlink.net/~curtis_bouterse/id4.html (accessed July2, 2007). To the thorough understanding of the present discussion, the term “lute” will be used with a generic meaning, representing the diverse types of string instruments. 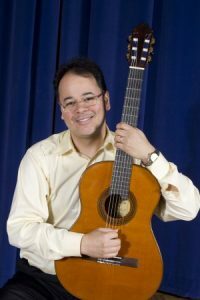 Curt Bouterse, “Guitarra Latina,” Alfonso X: Instruments then & Now, http://home.earthlink.net/curtis_bouterse/id6.html (accessed July 2, 2007). Robert Dearling, ed., The Illustrated Encyclopedia of Musical Instruments (New York, NY: Schirmer Books, 1996), 76. James Tyler, The Early Guitar: a History and Handbook (London: Oxford University Press, 1980), 15.